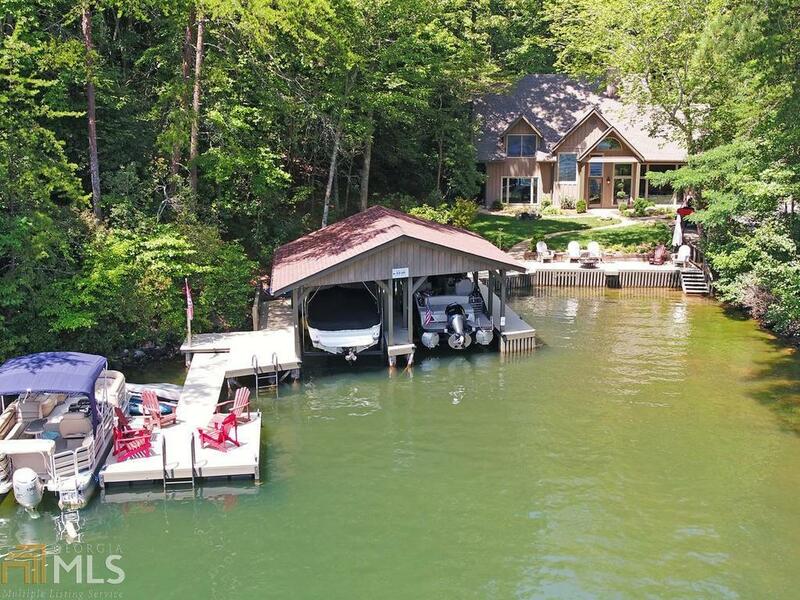 This Lake Burton gem features a rare combination of main lake location, panoramic mountain views, and a 1.75 acre lot with flat lake front--very few steps. Enjoy the view of Charlie Mountain and main lake from your own private cove. Main level includes vaulted living room with masonry fireplace, master suite, updated kitchen with stainless appliances and solid surface counters, separate dining area and 2nd full bath. The sunroom off the kitchen makes way to the private outdoor living space including a patio, deck with gazebo and noisy creek. Upstairs are 4 additional BR and 2 BA. The lakefront features seawall, extensive wharf, and 2-stall boathouse with lifts and storage. Ample parking for family and guests as well as access by (mostly) paved roads.